conveniently overlapping flow ranges available in both standard millimeter and direct reading scales. 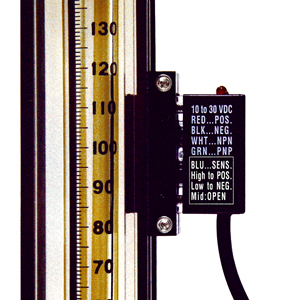 Designed for low flowrates, the model T flowmeter is a precision instrument embodying the inherent simplicity, versatility and economy of the classical variable area meter. It is particularly suitable for metering carrier gases in chromatography, indicating and controlling gases in manufacturing processes, liquid and gas measurement in laboratories, pilot plants, flow and level indicating, etc. 150 mm Meter with CV™ Valve. Shipped completely assembled, flowmeters include standard mounting fittings in a choice of materials, side plates, thick protective magnifying front shield and back plate, optional built-in control valve, and flowtubes selected from the Flow Capacities tables. Panel mounting style is convertible to bench mounting through the use of the optional acrylic tripod. The tripod has a built-in spirit leveler and leveling screws. Direct reading scales are indicating flow rates of liquids and gases,in engineering units such as [mL/min], standard cubic feet per hour [scfh] etc. Such scales are designed exclusively for a specific gas or liquid at a given set of pressure and temperature parameters, and are valid for the associated units of flow only. The convenience of direct reading scale designs should be weighed against the resultant limitations of applicability. 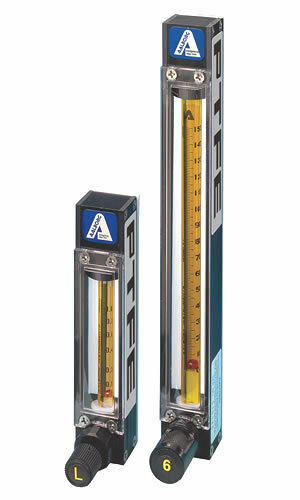 Generally, direct reading scales are most suited to OEM applications. 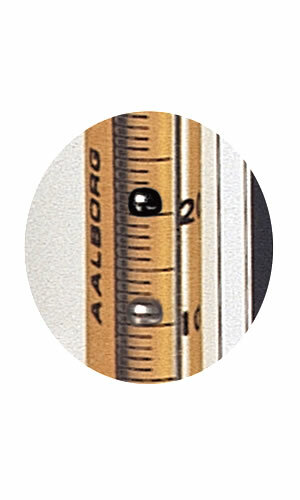 Millimeter scales indicate the vertical position of the spherical float within the metering tube as the flow increases or decreases. It is necessary to use flow tables or graphs supplied, to correlate float referenced readings with actual volumetric flow rates. The advantage of Universal type scales is the ability to utilize the use of a given flow meter for a great number of different fluids at diverse pressure and temperature conditions, generally preferred in applications in laboratories, etc. Meters are available with built-in needle valves (CVT™ ), high precision metering valves (HRT™) with “non-rising stems”, or with no valves. The higher cost of HRT™ valves is justified whenever high sensitivity control and resolution are desirable particularly in conjunction with metering tubes of very low flowrates. When meters with valves are ordered the valve cartridges are installed at the inlet. For vacuum service it is recommended that meters are ordered with valves at the outlet. AALBORG® is a registered trademark of AALBORG INSTRUMENTS & CONTROLS, INC.